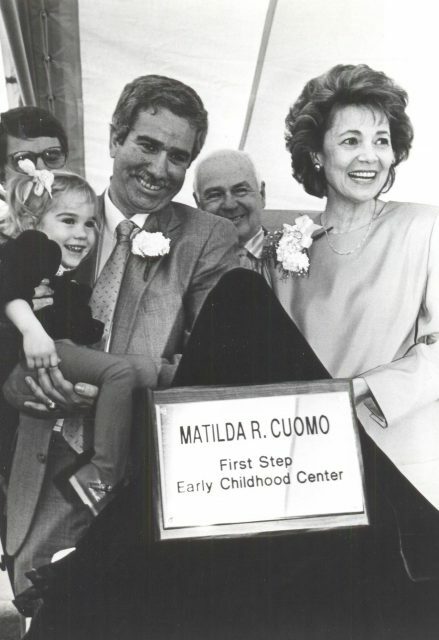 HeartShare President and CEO Bill Guarinello with Matilda Raffa Cuomo, the then First Lady of New York State at a dedication ceremony in 1988. Today, the Gov. Mario M. and Matilda Raffa Cuomo Family First Step Early Childhood Center is one of four HeartShare pre-schools educating nearly 1,000 students, including children with special needs. HeartShare extends an open invitation to the Cuomo Family for their re-involvement with its schools and for their help addressing this special education crisis. HeartShare has a pre-school named after the Governor’s family, but its mission to educate the City’s most vulnerable children—those with autism, Down Syndrome, cerebral palsy and other intellectual and developmental disabilities—has been largely forgotten in City and State budgets. “Although the New York State budget has allocated $1 billion to education programs this year, it still does not apply to private non-profit 4410 programs like HeartShare’s,” said Carol Verdi, HeartShare’s Senior Vice President of Education Services. Those 4410 programs are special education services and programs, including integrated classrooms where typically developing children and children with disabilities learn, socialize and play together. Verdi, who has been with HeartShare’s education programs since their inception in 1982, has seen funding for early education programs dwindle over time. “In the 1990s, we closed our early intervention program due to lack of regular funding increases. This was unfortunate because our Infant and Toddler Programs started working with children as soon as they were diagnosed,” said Verdi. The U.S. Center for Disease Control and Prevention recently found that 1 in 59 children are now diagnosed with autism, which indicates greater access to evaluation services. “Certified professionals determine whether or not a child has a disability and refer the family to needed services. HeartShare continues to offer evaluation services to determine if a young child needs specialized therapies and preschool services, but again, due to lack of regular funding increases, was forced to close the separate location where evaluations were conducted and move them into an already crowded pre-school building. Teacher and teacher assistant salaries are suffering too. For staff salaries, we were promised a 4% increase, but only received a 2% increase,” Verdi said. Additionally, HeartShare pre-schools, already running on a tight government budget, face increasingly complex regulations. “Our regulators often change their policies without alerting the impacted organizations. Then, when our programs do not reflect the changed standards, we face steep fines,” she said. “NYC Department of Buildings, for example, cited HeartShare because 20 percent of our hallways were covered in student artwork and were considered a fire hazard. We swiftly corrected this situation, yet we were still fined. Soon after, the NYC Department of Education cited this same pre-school for not displaying enough student work. Clearly, there’s a lack of communications across regulatory agencies as well,” Verdi explained. In 1988, when HeartShare’s First Step moved to its present location at 115-15 101st Avenue, Richmond Hill, it was dedicated to Matilda Raffa Cuomo, then the First Lady of New York State. In 2009, it was renamed the Gov. Mario M. and Matilda Raffa Cuomo Family First Step Early Childhood Center. HeartShare extends an open invitation to the Cuomo Family to become re-involved with its schools and help address this special education crisis. For further information, please contact Carol Verdi at 718-441-5333 or carol.verdi@heartshare.org.